Assess team performance at a glance. Easily evaluate the average number of tasks that were completed in a day for a selected period using mean, median and mode values of your throughput frequency distribution. Your average throughput is a representation of your capacity to deliver. Pro tip: In a dataset with a number of outlier values, the mean will be skewed up or down. In this case, use the median value to assess your team performance. Use past performance data to make accurate future predictions about your productivity levels. 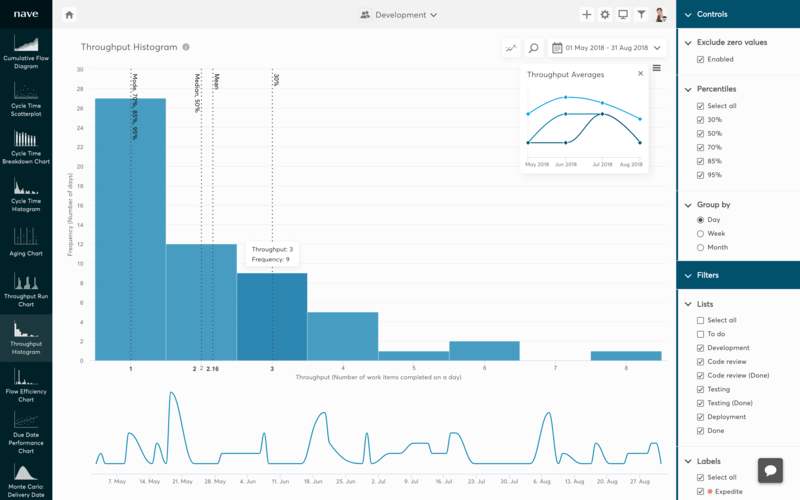 With the throughput histogram by Nave, you can forecast future delivery task based on the past performance of the team. Using percentiles you can assess what is the probability of a certain amount of tasks to be completed on a daily basis. Pro tip: Use your performance metrics as a basis for any short term commitments. Remember, every estimate comes with the certainty level of that goal being met. This chart overlay shows the mean, median and mode of the average throughput. Over time, you can identify trends in your team delivery rates. Ideally, the throughput should increase smoothly or stay at similar levels. The higher the throughput, the better your performance. Pro tip: Choose your average and watch its line profile! Decreasing gradients means that your team is delivering less value. Make sure you have work in progress limits in place to prevent bottlenecks and let the work flow smoothly. Increase your team productivity with Nave!